Features:12V/24V auto adapt,LCD display,USB ChargeAutomatically manages the working of solar panels and batteries in your solar system.Overloading & short-circuit protection. Reverse discharging & reverse-polarity protection.Under-voltage and over-charging protection. 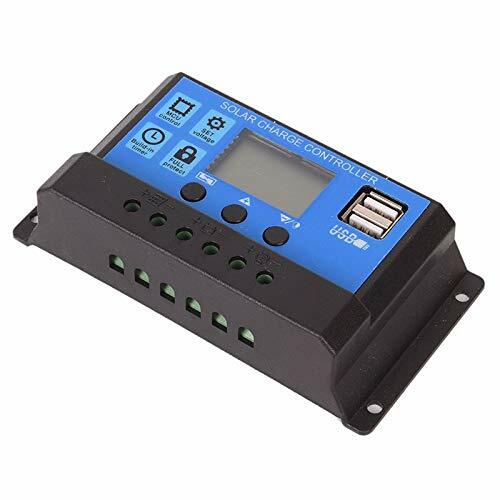 Protection from lightning strikes.Prolong the battery life cycle, and keep the load working well.This controller can charge and discharge at the same time. It has a perfect SOC function,control charge current, and supply power to the loads. The controller will automatically compensate the temperature of the charging voltage according to the changes of ambient temperature. Make sure your battery has enough voltage for the controller to recognize the battery type before first installation.The battery cable should be as short as possible to minimize loss.The regulator is only suitable for lead acid batteries: OPEN,AGM, GELIt is not suited for nickel metal hydride, lithium ions or other batteries.The charge regulator is only suitable for regulating solar panels. Never connect another charging source to the charge regulator. Easy to use. Product dimensions are described in detail on the product image. 85% conventional orders will be delivered within 10-20 days. Clients please note, products are only offered by the brand: Cacys★Store. All the other sellers are not reliable. If you have any questions about this product by Cacys★Store, contact us by completing and submitting the form below. If you are looking for a specif part number, please include it with your message.